The primary role of the altar servers is to assist the Priest in the celebration of Mass. In St. Emilie’s they are generally drawn from both male and female children of parishioners. ringing the bells during consecration. 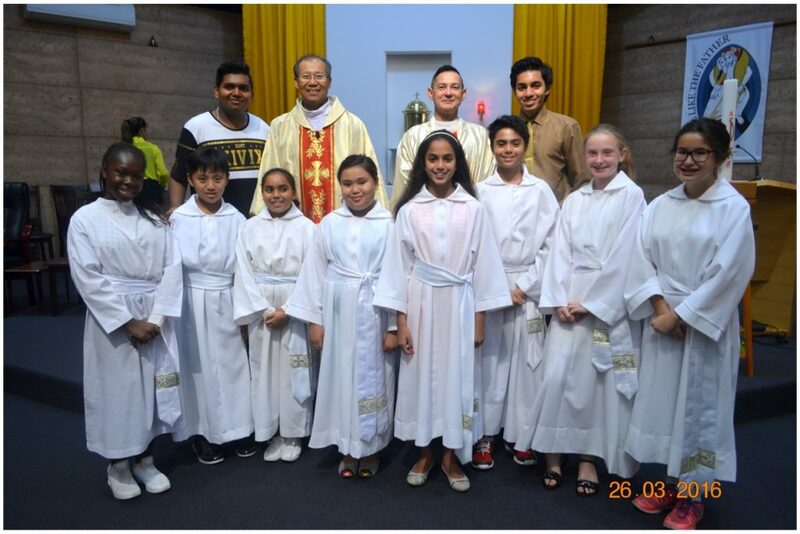 The only requirements to becoming an Altar Server are that children must have received their First Holy Communion and be available to attend altar server training. Training is usually held every month in the church after Sunday 5pm mass for an hour. Dates when training is held are usually published in the Parish Bulletin. On arrival at church when serving, the server would slip on an alb and sign their name on the Sign-In Sheet to show that they attended and served at that particular mass. Enquiries to become a server are welcomed and can be made to to Parish Administrator (Fr. Jean-Noël Marie).